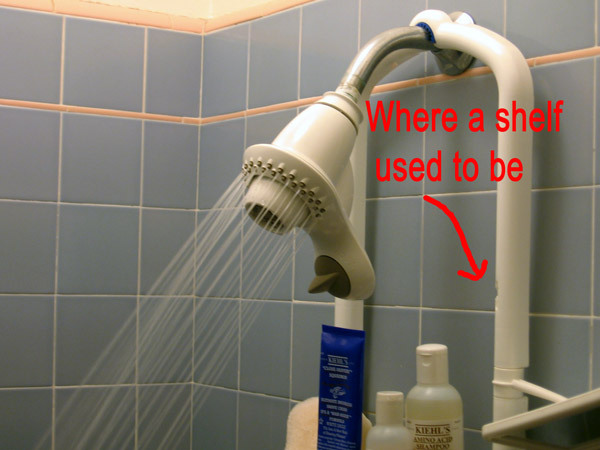 A few weeks ago, I read about the Moen Revolution showerhead on Matt Haughey's site. 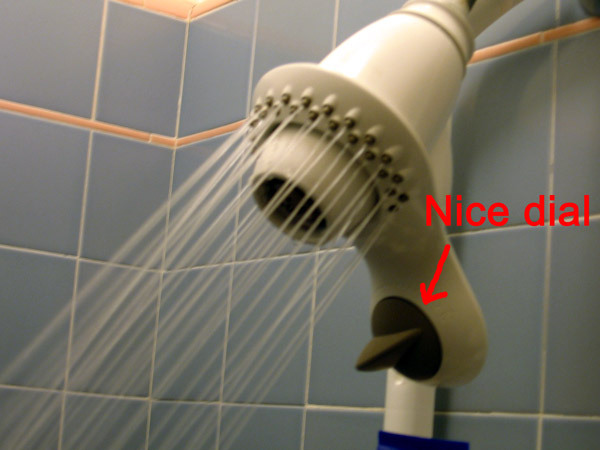 Our showerhead was seven or eight years old, so I decided to give it a try. The install was a breeze. Just unscrewed the old showerhead, applied new teflon tape, and screwed the new Moen on. I turned the water on and let the thing rip. The first thing you notice is the handle on the bottom to steer the water. It feels natural and moves smoothly. The dial on the handle is to change the kind of water stream flowing out. The handle does drop down a bit and was bumping into the highest shelf of the shower caddy thing. I finally removed the top shelf and all was well. Michele decided that this would 'not do' and is now on the hunt for a new shower caddy thing that can accomadate the size of the Moen. This is what I would consider the main showering mode. Plenty of water and not a lot of force. The children and I both think this is better than the old showerhead. Next I tested out the special mode. It's described as "Moen's patented Revolution technology takes ordinary water, spins each drop, then twirls the entire shower stream.". Well, it's kind of like one of those kiddy toys for the backyard that whips around in all directions. Fun the first time, but no use for washing. And the flow isn't strong enough to be considered a massage mode. This mode is the massage mode. But it's not much of a massage. The stream is just more than an inch in diameter and just doesn't have enough force to be considered a real massage mode. Now, maybe some dainty princess type might like it, but it was a disappointment to me. Conclusion: The Moen Revolution is a nice showerhead, but it's not revolutionary in any way except the handle. If you like the way it looks, get it. If you are looking for one of those back-massaging showerheads, this ain't it. Personally, being the shower head fan I believe I am, I am glad SOMEONE is spending this kind of bandwidth on new showerheads. 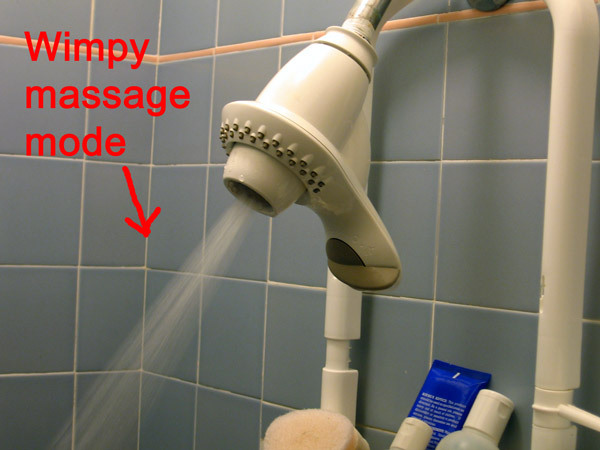 I propose a showerhead that has a build in shampoo reservoir that while the water shoots out, also shoots out the soap, thus never needing you to get any out of a bottle. I just got one too, last week, and I've been meaning to post about it. It had such high accolades and I've been searching for a new shower head that I figured it was worth the $50 risk. - the massage mode stinks, no pressure at all. If I put the back of my neck really close to it in this mode, I can just barely start to feel something, but as the water falls along the path to say, the small of your back, all the pressure is disapated rendering it massageless. I'm most surprised by the strong pressure on the normal shower mode and poor pressure on the massage mode. 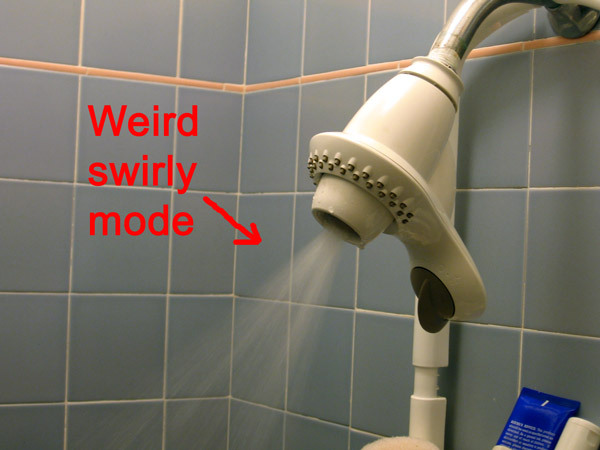 I read about this shower head and it sounded like the most tested, tweaked, and useful head of all time. I guess the lesson here is to take design review writeups with a grain of salt.